I wish I could say this was all a bad dream, or that I'm just great with Photoshop and have a twisted sense of humor. No, this is all real, and this nightmare is coming true for all of us. 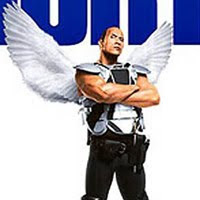 You see, The Rock has leveled out on the bottom of "high-concept" family comedies and can do no right. 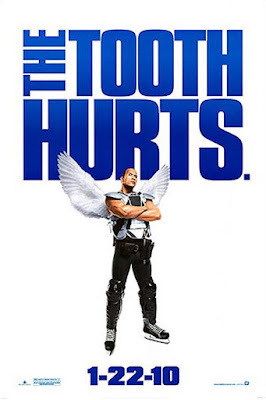 Alas, his next bout of kid-friendly high jinks pegs him as a former hockey player, that was nicknamed the "Tooth Fairy" for knocking out other players' teeth, and thus now must be an actual tooth fairy because he screws over his woman's kid. Whew... try saying that in one breath. Think of it as a mix of Liar, Liar and The Santa Clause, except for the fact that this won't make as much as the latter and won't be as funny as the former. I feel bad for Dwayne "The Rock" Johnson, because I know somewhere in there are some decent acting chops. Though I'm not a huge fan of wrestling, he did a great job playing the douchebag in the ring, and brought me many laughs. Why can't he get some decent work in Hollywood? I just hope he's getting good checks for these things. Yeesh. Check out the full poster below, via FilmDrunk.